It is now just over a week until festival season kicks off. I find myself feeling varying levels of excitement and nerves. I feel them every year but this year it is more noticeable. I guess it is because I am doing a new foreign festival by myself this year. I’m sure I’ll be fine, but you never know! Anyway, first up on the festival calendar is Download and I have nerves about this festival because it is the first time going for the weekend since 2007. The festival has changed a lot since then. I am sure I will be fine but because it is essentially a new experience, it is causing me some concern. Doing Wacken in the past has spoiled me as I want running times up earlier than a week before the festival, accepting that they could change at any point. I find myself getting impatient, which is exactly why I am writing this blog. I’m not attacking the festival or its organisers at all; this is just to satisfy my own impatience. 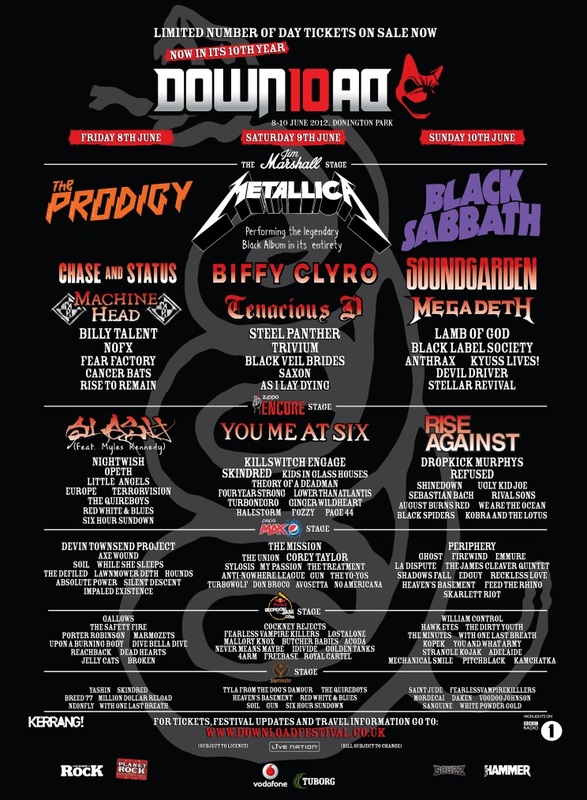 This is my latest guess at stage times for Download 2012. These are somewhat based around the times for 2011 with some changes where changes have needed to be made. I have no idea if these are right, but whatever. Kept me entertained for a few hours! 15.05 – 15.30 You And What Army? Assuming that these times are correct, or close to correct, my Download Festival 2012 on paper looks something like this. Nice opening day to a festival I’d say. Gutted about missing Axewound but I reckon they’ll be back at some point. Would have liked to be able to see Gallows on Red Bull Stage as well as an acoustic set from Skindred. This is where I hope my times are wrong somewhat. Not really missing anyone here I am really gutted about missing. Wouldn’t have minded seeing Black Veil Brides but they lose to Ginger. I am really quite pleased about possibly getting to see The Treatment again. I’m not too sad about missing Megadeth over the course of the weekend as I’ll see them headlining Hellfest the week after. Much the same with Dropkick Murphys I think. However that one is still up in the air. If I can’t be bothered to see Soundgarden for whatever reason, then I’ll see Dropkicks (or Hawkeyes). As for Black Spiders and Devildriver clash, I’m leaning as of this writing towards Devildriver but I fully suspect to see all of Spiders. Mostly because Devildriver are at Hellfest but if I have the energy after Download then I’ll go see them headline in Soton. Anyway that is all I have on the Download front for now. I will likely post my actual running order when the times are released Friday (and try and do a comparison between my guess and the reality). As for future blogs? Well there will be a GnR review up sometime after Wednesday (might even type it on the way home) and a Ginger Wildheart review as well. Download and Hellfest reviews will likely be towards the end of June.